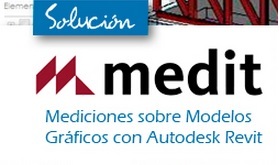 Medit is an extension of Autodesk Revit, developed by BIM Ibérica to automatically generate project measurements. It is a tool that establishes the logical relationships between budget and model BIM to streamline the management of measurements and budgets. This process significantly improves the productivity of projects by allowing an earlier start of measurements and budget, encourages a more reliable coordination of budget information between the team, detects and resolves inconsistencies in the process and allows consultation Snapshot of the measurement states of all or parts of the project.